The highest paying jobs in nursing are the ones that typically require the most educational training and experience. The field of nursing is extremely diverse in the types of roles available to nurses at all levels of education. Degrees available for nurses range from hospital program certificates to doctorate degrees in nursing, all of which are from accredited programs where students attend classroom studies as well as clinical studies in hospitals and clinics. Some of the top ranking nursing programs include those offered at Yale University and John Hopkins University, where students can obtain several types of nursing degrees, from bachelor of science in nursing to doctorate in nursing. What are 5 of the Highest Paying Jobs In Nursing? A nurse’s salary varies depending on where they practice, what education they have and how many years of experience they hold. The farther you take your education as a nurse, the more higher paying job you can expect to obtain. Perhaps one of the most common highest paying jobs in nursing is that of a nurse practitioner. Nurse practitioners hold a master’s degree in nursing and function as medical practitioners, where they examine patients, diagnose medical illnesses and conditions and prescribe medications, among other tasks. Nurse practitioners work in hospitals, clinics, urgent care centers, nursing homes and other health care facilities and earn an average salary of $85,200, according to CNN Money in 2009. Another high paying nursing job is a CRNA, or a certified registered nurse anesthetist. CRNAs work in hospitals in the operating room, where they provide and monitor the anesthesia of patients who require surgery. 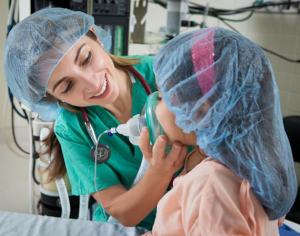 CRNAs are nurses who hold a bachelor’s degree in nursing as well as several years of critical care experience, who then go on to study in a master’s level nurse anesthetist program. CRNAs can expect to earn a salary of $169,000, according to LocumTenens.com in 2012. Clinical nurse specialists (CNS) are also high paid nurses. They are responsible for typical nurse duties in the hospital, as well as manager duties, such as improving nurse practices and outcomes of patients. Clinical nurse specialists hold a master’s degree as well as several years of experience in nursing and can expect to obtain a salary of $62,000 to $79,000 per year in 2013, according to Discovernursing.com. Nurse researchers can expect to earn a high paying salary as well. Nurse researchers are found in hospitals, government settings, universities and private research labs where they research and study nursing practices, pharmaceutical data and nursing products in order to improve nursing care and patient experiences. Nurse researchers hold, at minimum, a master’s degree in nursing as well as nursing experience. As one of the highest paying jobs in nursing, nurse researchers can expect to earn a yearly salary of $95,000, according to Explorehealthcareers.org in 2013. Nurse informatics analysts are responsible for implementing and managing computer applications which hospital staff members use. Typically, nurse informatics analysts have a master’s degree as well as have some nursing experience. They may also obtain experience in health administration. Nurse informatics analysts earn a yearly salary of $79,000 to $83,675, according to Explorehealthcareers.org in 2013. These are just a few of the examples of the highest paying jobs in nursing.